I recently acquired a mason jar cookie cutter…which I have yet to use for actual cookies. First, I used it for melting pony beads into sun catchers. 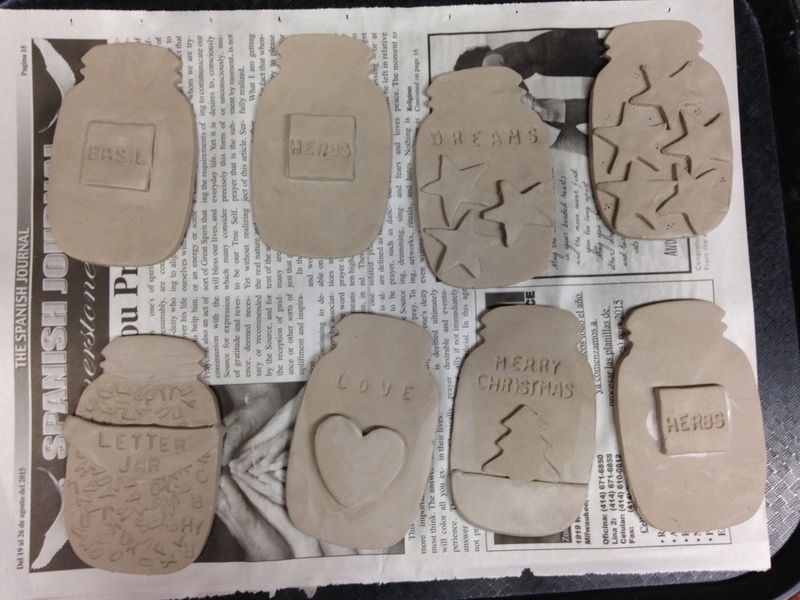 I have now graduated to using my lovely mason jar shape on clay. I’ve been meaning to do this for a while now, And I’m quite pleased with how the first batch turned out! After I had the shapes, I just went to town on them and had fun! I’m still deciding on colors, but that’ll come later anyway. They will need to be fired, glazed, and fired again, and I’m very excited to see how they will look when they’re done! I will eventually use wire to make them into ornamental pieces, and I will hopefully add ribbon to that wire to accent the colors that will be on the jars. The only thing I am concerned about is that the Center in which I have done this does not have a great selection of glazes anymore. The ones that are left will not be as solid or as vibrant as I was hoping them to be, but I will do my best with them. Something new that I tried out was to stick alphabet pasta into the clay to make words, and so far I’m happy with how they look. My main concern is that the words won’t be as visible as I put them through the firing/glazing processees, but I will post more pictures of the finished products. I’m hoping that there will be no problems with that. Now…I wait a couple weeks and pray that they survive.